oh and yes i think we should follow eachother! That is a fabulous idea! 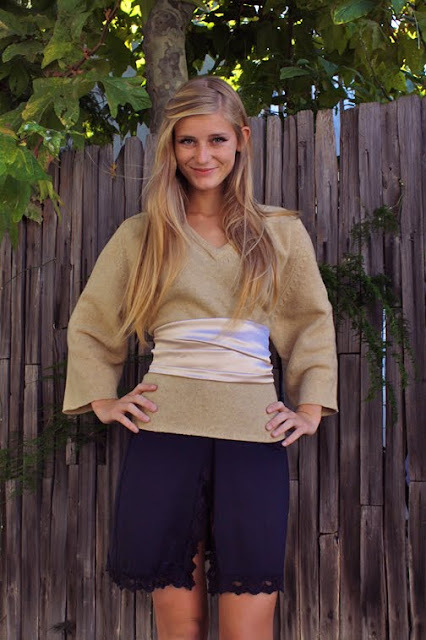 I'm definitely going to be trying that...the silk works like an obi belt, I love it. I love your blog, the photos are great! Really lovely outfit! love that asian style. Nice blog do you have! Really creative, I really like the look you've created here. Gorgeous. I like this look a lot! Recycling is so important! Great idea! I hope you'll show more of those inspirations! And girl, you are so incredible beautiful! So photogenic! Wow, you guys are good at this stuff! Cool sweater! Beautiful work. I would wear it! Lovely look, the silk tie is so stunning. Reminds me of a kimono. Love your blog, stunning photos and great fashion inspiration. love the kimono inspired look! Gorgeous outfit. You did a remarkable job with it. I especially love the sash, which was a brilliant touch! i like ur blog! just checked it out. ill add u to our blogroll! This outfit is nice and simple and I love the the back ground with the tree branches sneeking through the fence boards to get in to a beautiful picture. Very cute. You've got really great style and I like your blog. you and Camilla make such a great team, i love your blog. This is such a great idea, it looks absolutely gorgeous! Love the obi belt. But the colour of the sweater is kind of...don't know, something strange between green, yellow and brown. Maybe you should dye it. I can't believe you're mother & daughter! I thought you were friends/sisters! lol! 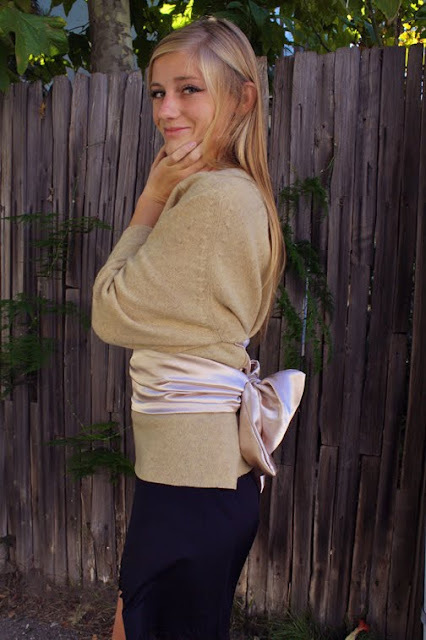 Oh I love how you tied the bow! What a great idea! i love the jumper over the slip dress! thanks so much for following my blog, im following you too now- love your style! This is a great idea..I love the sash too. Love this look. I am now following you! love the line on your eyes!! !